Wow, I’m MVP of the week! Wow, I’m MVP of the week! A great big thank you to all you guys out there, this is really something. Had a very nice podcast chat with Jim McKeeth on all things Delphi, that brought back some memories. It was great fun to do. 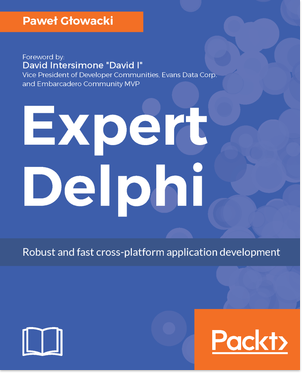 Delphi is just the greatest development tool, now even more than ever. What other development tool do you know that compiles your application with one framework and one source code to Windows, Mac, Android and iOS? Delphi 10.1 Berlin has been released today! This release has lots of useful new features, small and large. Such as asynchonous dialogs in Windows and OSX (ShowMessage is now async in OSX), support in the IDE for Android Smartwatch apps, support for Android 6.0, IoT devices, and much more. FireUI Live Preview wil give you an actual preview of how your application will look when actually run on the target operating system. Not only very cool, but also very useful. Also many small (and not so small) bugfixes. For instance in the way TTask internally handles WaitForAll. The bugfix there now correctly handles many small Tasks switching back and forth. Not something you are likely to encounter, but good to have fixed nonetheless. A thank you to Allen Bauer for fixing this. For the full list of new things take a look at Whats New in Delphi 10.1 Berlin. We will also demonstrate these new features at the Delphi Benelux 2016 Congress on the 26th of May in the Evoluon in Eindhoven, where Pawel Glowacki, Bob Swart, Stephen Ball and Danny Wind will show you how to use all these new goodies.